Soon after liquor inventory was stocked on the warehouse shelves, warehouse managers noticed cracks appearing and growing larger in the floor slab. 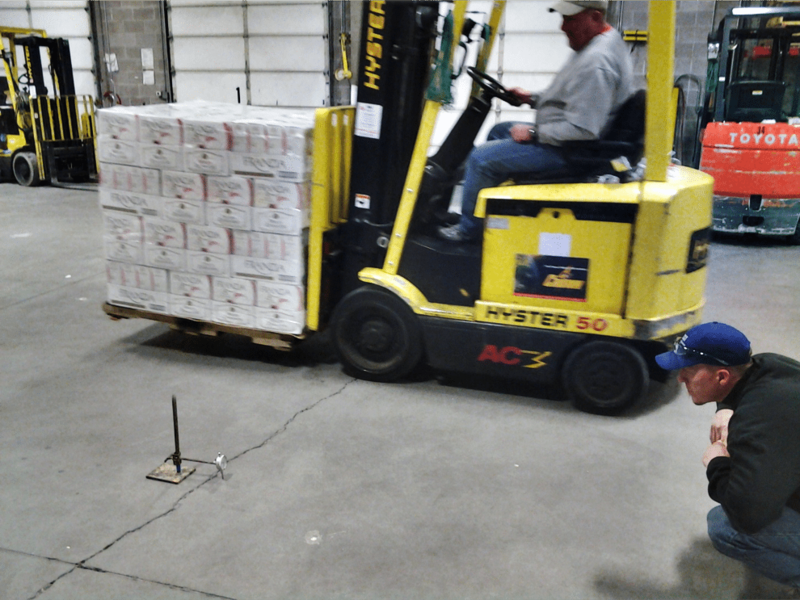 The additional weight from liquor inventory combined with constant pounding and vibration from forklift traffic expedited the weakening of the sub-base and floors. Warehouse management quickly recognized the topple hazard of the uneven shelving and trip hazards created by uneven floor slabs, as a huge safety concern for employees working in the facility. Numerous areas of differential settlement in the slab. High spots caused by poor finishing techniques. Unraveling joints in several locations. Cracks in the concrete slab ranging from hairline to 1/4” in width. The URETEK Method® was used to underseal, stabilize, and realign mismatched and uneven slabs. Joint sealing and crack repair to protect surface. Grinding/smoothing high spots in rolled joints. Remove and replace unrepairable concrete sections. URETEK successfully treated approximately 12,000 square feet of warehouse flooring. URETEK completed the undersealing, slab lifting and realignment, and overall stabilization of the entire warehouse floor in 3 ½ days.